Keep those tiny hands busy during diaper changes with this DIY wall-mounted baby mobile tutorial! Baby mobiles are a great way to keep little ones entertained and visually stimulated. But, to my surprise I couldn’t find a small baby mobile to go over a diaper changing table to keep my little girl distracted. Toys have done a pretty good job keeping my babies hands occupied while she gets her diaper changed. But, each time we left the changing pad area, the toys left with us. When it’s time for another diaper change, I find there are no toys within arms reach. 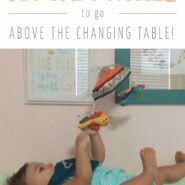 When my baby was about 4 months old, I decided to find a way to attach a mobile or hanging objects above her changing pad. No more searching for toys or hands flapping in the wrong places! This homemade baby mobile was just the trick I was looking for! It has kept her hands and mind busy during a diaper change and the toys are here to stay. This DIY wall-mounted mobile is super simple and only requires a few pieces of hardware. 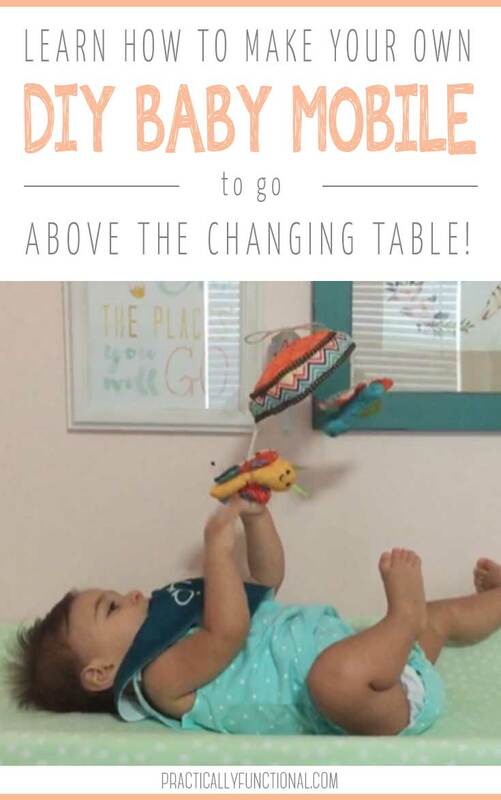 Likely, you already have some toys around the house that can be hung above your baby’s changing pad to complete her mobile. Toys from her tummy time play gym can be reused and are perfect objects to include in this project. You may be thinking… this may interfere with the decorations in my baby’s room. 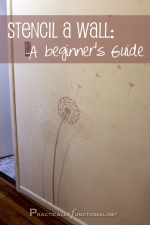 I put a lot of thought into her wall décor too, like most moms when preparing for a new baby. But, this simple addition didn’t interfere with the décor or draw too much attention. And, it was definitely worth adding! First, it’s important to take note where your baby’s hands reach out above her as she lays on the changing pad in relation to the wall. 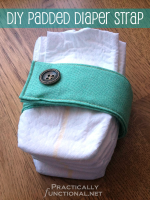 I mounted the bracket 14″ from the head of the changing pad, but you may have to make a slight adjustment. The top of the bracket was mounted 19″ high from the changing pad table. 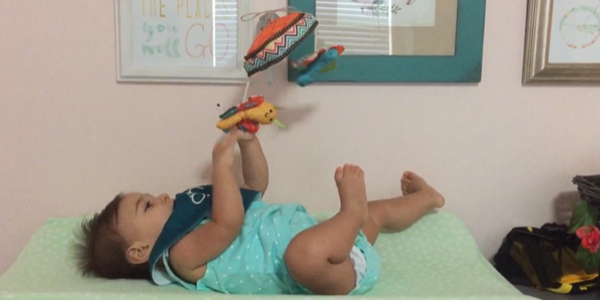 This height allows my baby to touch the toys when she is laying down, but still gives her room to sit up on the changing pad without bumping her head. Once you have found the sweet spot for the bracket, use the pencil to mark the wall in the three spots where the drywall anchors and nail will go. Remove the bracket and begin the securing process. 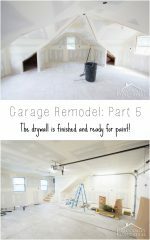 Use the instructions to install the drywall anchors in the top two markings. Once they are flush with the wall, center the bracket over the two anchors in the wall. 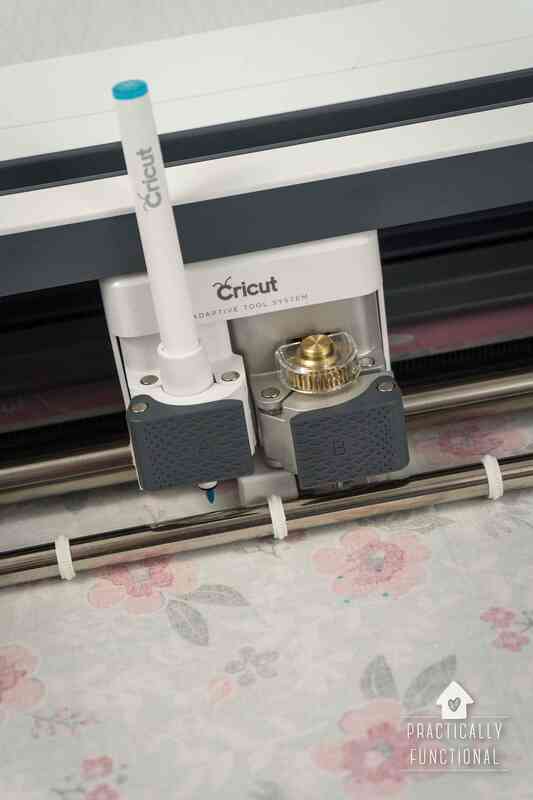 Proceed to insert the screws following the directions on the packaging to attach the bracket to the wall. Lastly hammer the nail through the bottom hole of the bracket. Now it’s time to add the mobile toys! Loop one piece of hemp through the toy and the bracket hole above the changing pad. Tie the hemp in a bow at the top of the bracket. Using a bow will make it easy to remove the toy to clean or exchange with a different one. Choose a good level for your baby to reach the toy and bat around, adjusting the hemp string as needed. Repeat this step again if you would like to add more toys. Need some ideas of what baby toys to attach? 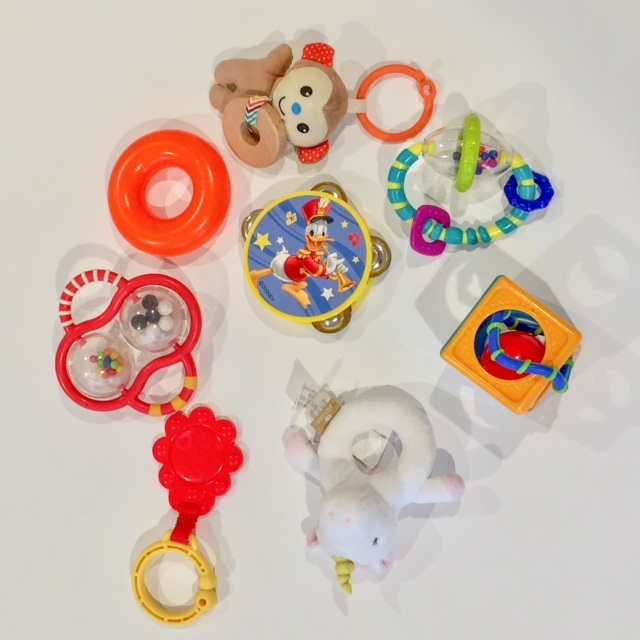 Here are some toys we like to attach to her baby mobile above her changing pad to keep things interesting. Maybe you have some of these baby toys at home too? 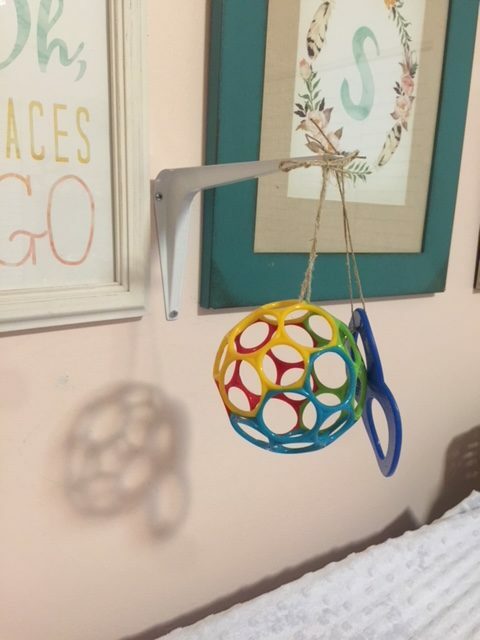 I hope your baby enjoys this DIY baby mobile as much as Baby S enjoys hers! What are some ways you entertain your baby when it’s time for a diaper change? Jeannie is a mother to two children. Her background is in education and she has taught in both elementary and preschool. You will see her write about arts and crafts, educational ideas, being active, and a variety of other activities she enjoys doing with her children. Parenting has its challenges. Therefore, she likes to share tips that have been helpful in her experience of teaching and raising her own children in hopes to help others too. 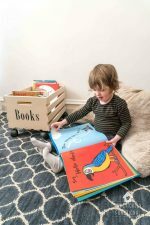 Visit her blog https://planetteachersblog.com and follow her on Pinterest https://www.pinterest.com/planetteachers/jeannie-planet-teachers-blog/ for more tips and ideas when it comes to working with children. « Yes, Your 3-Year-Old CAN Do Chores!